Use this arc shaped ruler set to make shallow or curved lines. Great for leaf shapes. 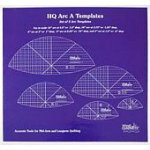 Template Sizes: 4", 6" 8" 10" 12". 14" inch thick high quality acrylic, insures safety when used with a hopping foot. Etched lines provide long lasting accuracy when quilting. Use with any brand mid arm or long arm quilting machine. Package includes instructions for use, safety tipe, design ideas.